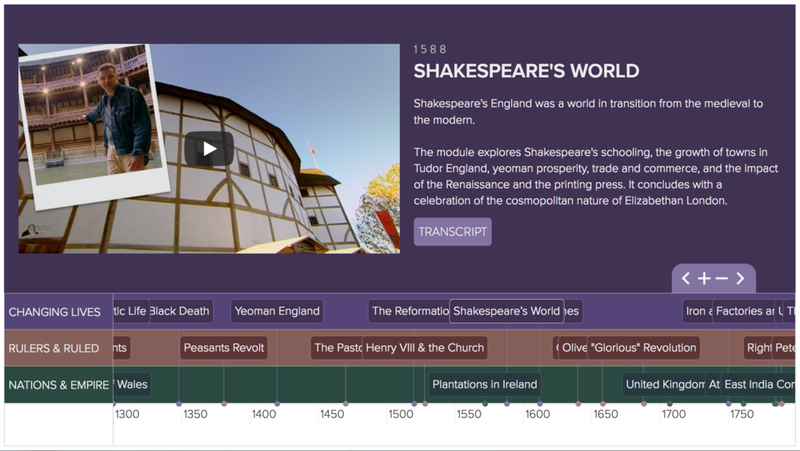 Timelines.tv is a free-to-view online resource delivering a thousand years of British history in 50 video modules. Andrew launched the site in 2010 with his long time collaborator Paul Trainor. From the medieval world to the miners' strike, the resource offers Andrew's engaging take on the History of Britain. Filmed in castles, cathedrals and factories the length and breadth of the UK, it shows how the complex trajectory of the national story fits together into one coherent whole. The material on the site was originally commissioned by the BBC, and was broadcast between 2005 and 2008 as 'Timelines', a series of five hour-long programmes. The series was written, directed and presented by Andrew, and produced by Lodestar Productions and October Films. The PURPLE timeline covers Social History - the story of our changing lives. The BROWN timeline covers Political History - the story of rulers and ruled, from feudal tyranny to the dawn of democracy. The GREEN timeline covers Imperial History - the story of the formation of the UK, and the rise and fall of the British Empire. The site won the 2010 BAFTA Award for best educational resource. Re-launched in 2018 in a simpler format and with higher resolution videos, it remains a perennial favourite in British schools, with 2.5 million views to date.